Reliable Swiss performance is ready to roll! The Sphinx SDP is a duty-sized handgun that can adapt to virtually any role. Its competition inspired trigger is smooth and crisp that allows for an even and consistent break in operation. Praised for its ergonomics, the grip fills in the gap between the hands for a true fit. And is interchangeable to various sizes for a custom fit for the individual shooter. An accessory rail accommodates a wide variety of lights and lasers. The Sphinx SDP is the preferred choice for self-defense or law enforcement / military duty worldwide. Pull the trigger to order yours right away! Kriss USA Sphinx SDP, Semi-Automatic, 9mm, 3.7 Barrel, 17+1 Rounds is rated 5.0 out of 5 by 1. 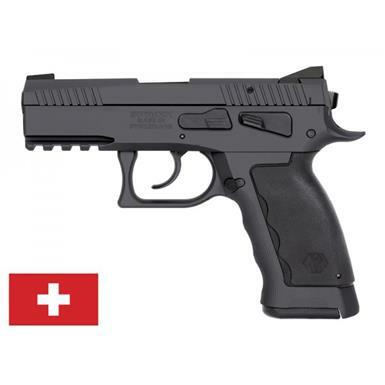 Rated 5 out of 5 by CTexas from Very high quality firearm! This gun is amazing! It is extremely well made, very crisp trigger and smooth on the double action. Not mentioned in the product description, this is the "Duty" model which has the aluminum lower frame rather than polymer. It comes in a hard plastic case with two 17 round magazines, magazine loader, cleaning kit, small and large grip back straps and the medium installed on the pistol, and a tool for removing the back straps. The color of the gun is grayer than pictured here.